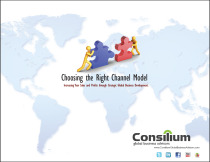 FREE eBook "CHOOSING THE RIGHT CHANNEL MODEL"
NEWS FLASH! The orders won’t automatically roll in. This is going to take some work. You first have to create the demand, identify and nurture projects and then sell, sell, sell! That leads to the critical question.